I probably chose the worst weekend to enter a game jam, but I created something, so that's... something. 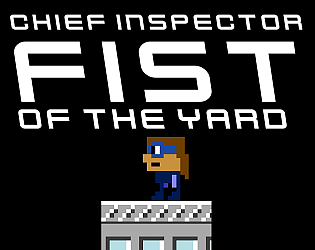 You are Chief Inspector FIST of Scotland Yard, a futuristic Super Cop designed to fight the gangs of Anarco-Liberal Crypto Facists that have taken over the city. Fight them with your super-strong FIST action. I had time to make only one mission, to clear out a warehouse full of gang members. Everything (except the font) was made by me. Music, Graphics, Gameplay. Yeah, made it to the end this time. Nice game. You can wall jump, and if you hold space you can do a short glide. I probably should have put that somewhere in the controls. I liked how you can throw enemies and that they interract with such things as spikes, however when 13 guys are left I reach a point where I can't jump high enough to get futhurer.